Ride the G: to Southport South Station. Have ever wondered what it was like to grow up in an era when Aussie rock music was everything? Or just looked back and wished you could see a band that wanted to knock your head off with great music? Well, wonder no more. Audiences can now be floored by the dynamic and expressive moves of Garrett and the Oils and back that up with giant slabs of Aussie rock legends Doc Neesen and The Angels and the incredible Chrissy Amphlett fronting the Divinyls. MADE IN AUSTRALIA presents three legendary Oz bands for the price of one …. and not just any bands. 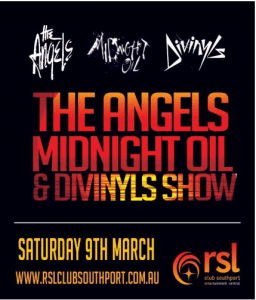 Three of the most incredibly energetic and dynamic rock bands ever to grace the live stage, The Angels, Midnight Oil and The Divinyls. The night will consist of hits galore, including ‘Beds are Burning’, ‘Blue Sky Mine’, ‘Power and the Passion’ and everything else you expect from the Oils and then get ready to ‘Touch Yourself’ and rage with the ‘Boys in Town’ and or take a little trip into the world of Science Fiction with Chrissy and the Divinyls. No chance to take a break because the evening will wrap up with a non stop trip into Aussie rock history with the incredible Angels. Everything from ‘Take a Long Line’, ‘Am I Ever Gonna See Your Face Again’, ‘Marseilles’ to ‘Coming Down’, ‘We Gotta Get Outta This Place’ and heaps more.